Volunteering at educational eco-farm. Sleeping in a tent far away from the skyscrapers and very close to the Chinese border. Cementing, gardening, mowing during the working days. 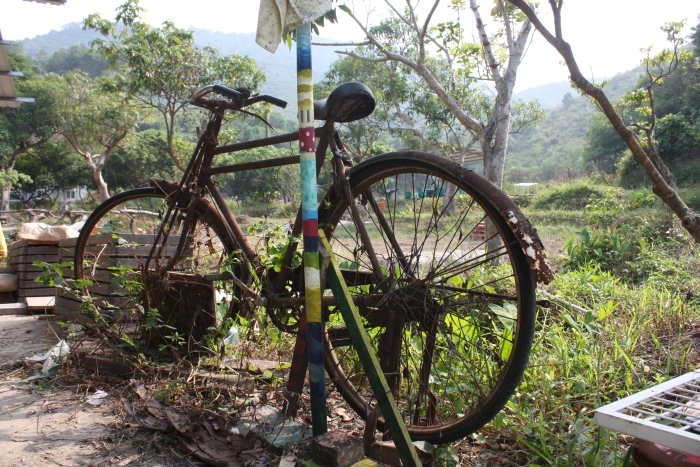 Cycling, museums, protests sites, islands hopping, trekking and regular sightseeing during the days-off. 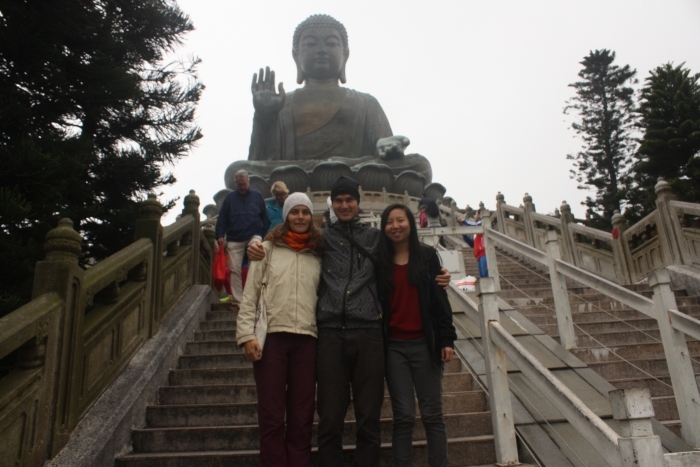 This was a brief introduction to our seven weeks we spent in Hong Kong. We came to Hong Kong, semi-independent city state under the rule of China, in the middle of October. Before we spent one month backpacking in the Philippines. Filipino tourist immigration service is quite specific. Not only you have to pay exit fee (around 10 EUR) when leaving the country, but you are obliged to have a proof of your departure ticket leaving the country at the time of entering the area of the Philippines. It means, we needed to know where we will go next before reaching the Filipino soil. It was quite unusual situation because we didn´t really plan that much and our all Asian trip is made by cheapest-fly-ticket-win philosophy. So bought the cheapest flight out of the Philippines one day before our arrival there from Malaysia. Later on, we found out that many travelers simply make up their receipt of alleged boarding pass in Photoshop and the responsible ones at the immigration don´t really check it properly. We didn´t know about this „option“ so we sticked to the standard procedure. 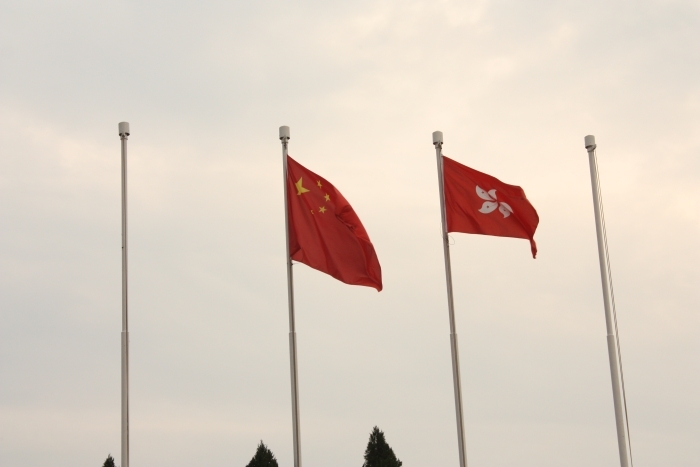 The smaller flag on the right is a flag of Hong Kong. The bigger one, on the left belongs to People´s Republic of China. This is how are the two flags always displayed. Hong Kong (HK) is a very specific city-state. It´s officially under the goverement of People Republic of China but there are many buts. The currency is Hong Kong Dollar not Juan as in China. Citizens of Hong Kong posses their own passports which allows them enter many countries without visa unlike their Chinese counterparts. The spoken language is Chinese Cantonese which obviously differs from the official Chinese Mandarine used in mainland China but Hong Kong Cantonese is also slightly different from Cantonese spoken in the South East Asian countries (Malaysia for instance). Chinese Mandarin which is official language in mainland China is compulsory taught at schools since handover in 1997, when United Kingdom officially handed Hong Kong to the China. The British took over HK after the victory in Opium Wars in the middle of 19th century. Nearby Macao island, currently known as a Las Vegas of Asia, was handed back to China from the Portuguese rule in 1999. Both mentioned islands are governed under the rule: one state, two systems. It means that both city-states have officially declared sovereignty and independence in many areas. However latest two-month lasting students protests in Hong Kong showed that maybe it´s not really that perfect as it should be. I will deal about this topic later. 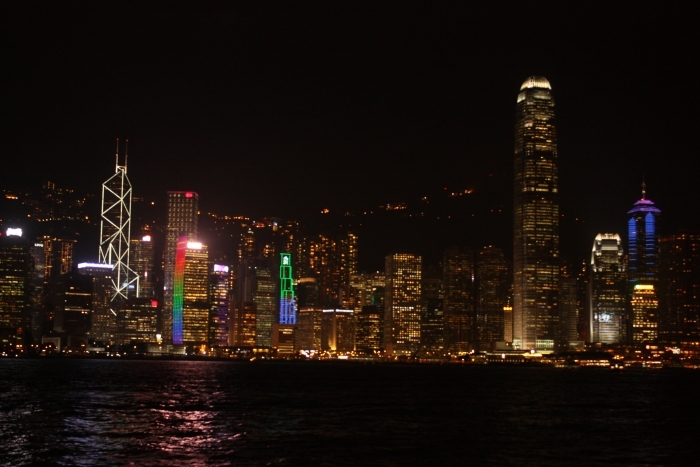 Hong Kong Island skyline and Victoria Harbour. View from the Kowloon peninsula. It is said that there is more skyscrapers in Hong Kong than in New York City. Quiet fishing villages are easy to be found outside downtown area. Too much greenery and protected areas, but where are the skyscrapers? Hong Kong is believed to have more high rises than New York City. I love all glass-concrete tall building (Maybe because we don´t really have them in my home-country Slovakia) that is why I was seriously excited about that city. The notion that Hong Kong is made up of more than 200 small islands and almost 70 per cent of its area is a countryside and 40 per cent of it it´s under protection was a nice green surprise! 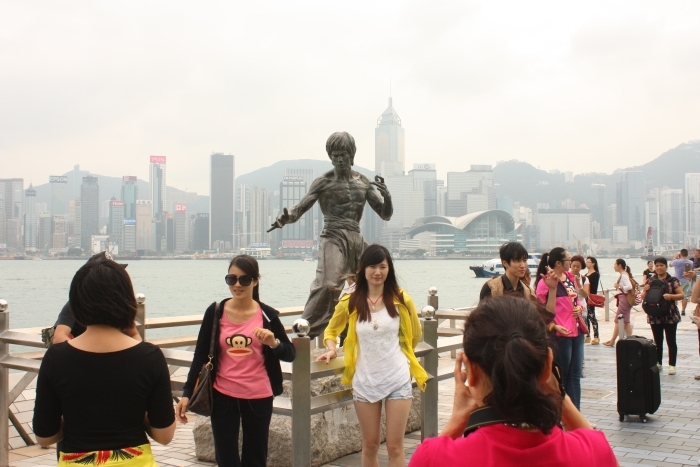 We also understood very fast that Hong Kong is not only that very famous Hong Kong Island with well-known skyline. The largest part of HK consists of Kowloon and New Territories, peninsular extension of mainland China. Relaxing in “open living room” on an eco farm where we worked. Hong Kong was definitely our most expensive destination in Asia. The prices were comparable and sometimes higher than in Slovakia. So we kept avoiding all expensive touristy restaurants. It means we mostly ate at a small local places where they rarely kept English menu and sometimes even didn´t speak English enough for making a proper order. Many times we just pointed to nearby consumer´s meals and ordered exactly what they had. (Right now in India, we use this very helpful tool too 🙂 I think we also improved our chopsticks eating skills. Of course, we didn´t become professional in that but after Hong Kong practice, we are finally able to enjoy eating the meal with sticks and it´s not anymore an hour-long struggle of feeding ourselves. Menu in local non-touristy cheap restaurant. Ordering food required sometimes body and sign language and was full of fun! 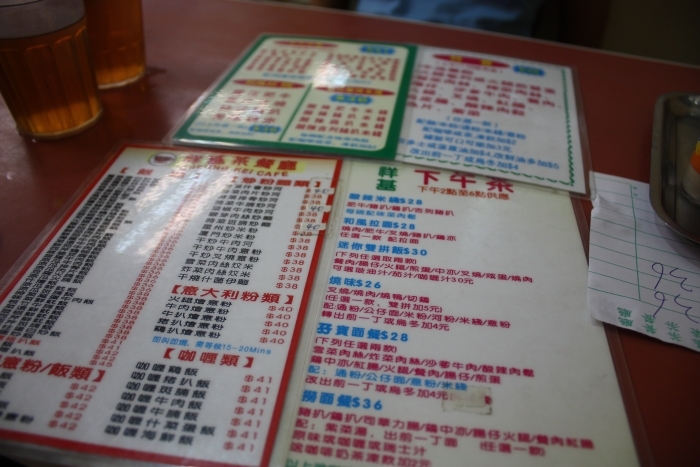 Hong Kong has two official written languages: Chinese and English and three official spoken languages: Chinese Cantonese and Mandarin and English. That is why we were rarely really lost in translation and almost every signs were easily readable in English (apart from those small local restaurant mentioned). 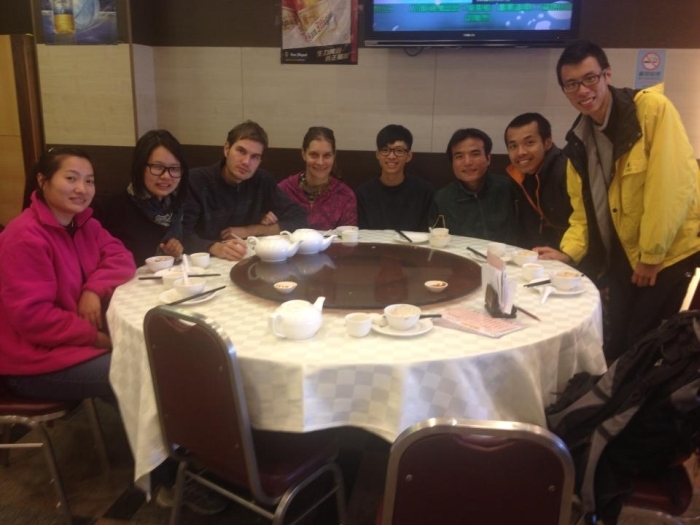 All our coworkers in the farm were mostly in our age and claimed that they don´t really speak nor understand Chinese Mandarin spoken in mainland China. Their mother tongue is Chinese Cantonese and when the obligatory classes of Chinese Mandarin started after the handover, they have already missed it. There was one very hardworking woman in the farm who came from mainland China with her family only few years ago and now is successfully settled in HK. She didn´t speak much Cantonese and our co-workers didn´t speak proper Mandarin according to them so they supposed to have a very complicated debate. But from our point of view, they just spoke to each other with full fluency and we were seriously not able to distinguish Cantonese from Mandarin. Farewell lunch with our nice co-workers from the farm. As we were not able to recognize by hearing Cantonese from Mandarin Chinese we were also very poor in distinguishing citizens from Hong Kong and citizens from mainland China. All Hongkongers were sure that we must have seen the difference in appearance and simple the masses of mainlanders who are literally „invading“ Hong Kong and crossing borders on daily basis for quality products shopping in Hong Kong and subsequently exporting to mainland China. Of course we were aware of that. You don´t need binoculars to see people carrying big luggage (mostly suitcases) in every single train on our line. At the beginning we were really surprised how come that there are always people with a big baggage even though our subway line was very very far from the airport. It became clear later one. The subway line we used to take leads to the Chinese border and our station was only one station before the actual border crossing. So the concept of businnes was following. You live in mainland China very close to Hong Kong. You wakes up very early in order to get to HK with your empty big suitcase. There make a big shopping and return to the mainland China. If possible you are able to do this turn three times a day. We heard that this is how someone makes a living. There is a lack of quality products in mainland and Hong Kong is so close, so why don´t do it that way. The demand for better goods is big. 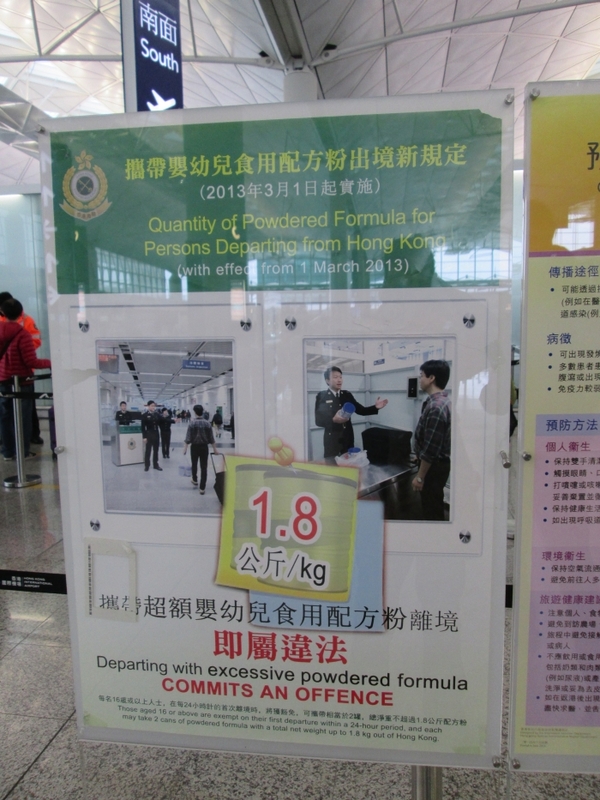 So that is why the warnings for the maximum amount of milk powder formula for persons departing from HK were seen everywhere. And the limit for mentioned exporting of powder milk is 2 cans (1.8 kg) per 24 hours. As I already wrote above, we spent totally seven weeks in Hong Kong. 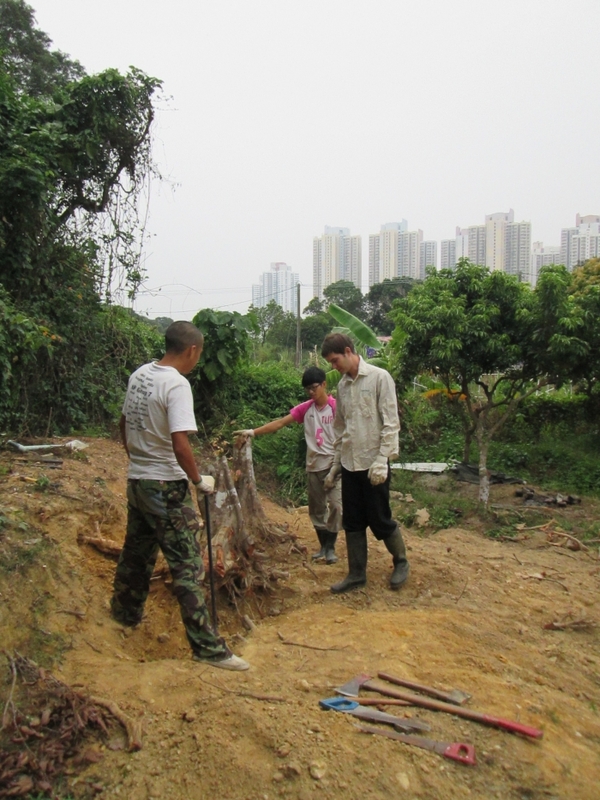 During the whole time, we worked as volunteers in nice eco, educational farm, located very far from skyscrapers and the bustle of the city. Train ride to downtown lasts almost an hour and walk to the station another half an hour. 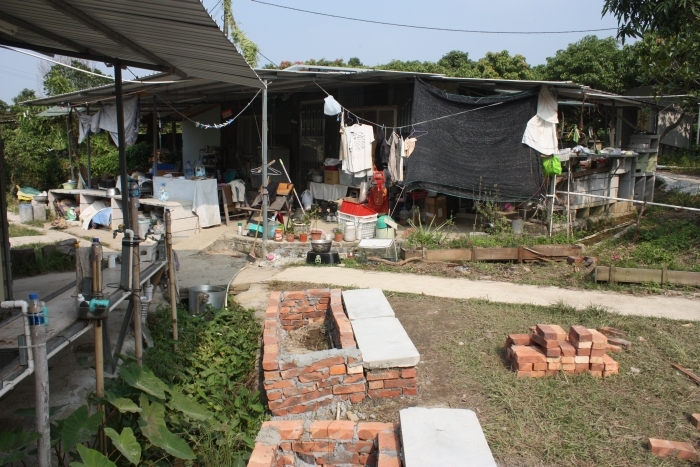 Our working place can be described as a garden surrounded by similar gardening and resting areas. There are many such places in Slovakia actually. It really reminded me of my godmother´s garden located close to my hometown where I used to help with various gardening tasks. Many enthusiastic young locals work there as permanent staff and way more is helping occasionally on volunteering basis. And we were the first international volunteers they had. The concept of WOOFing, which is the same what we did there, helping a few hours a day in exchange for food and accommodation hasn´t been applied before. These future flower pots were not made by our hands but the adjacent supporting walls for the benches is our job! 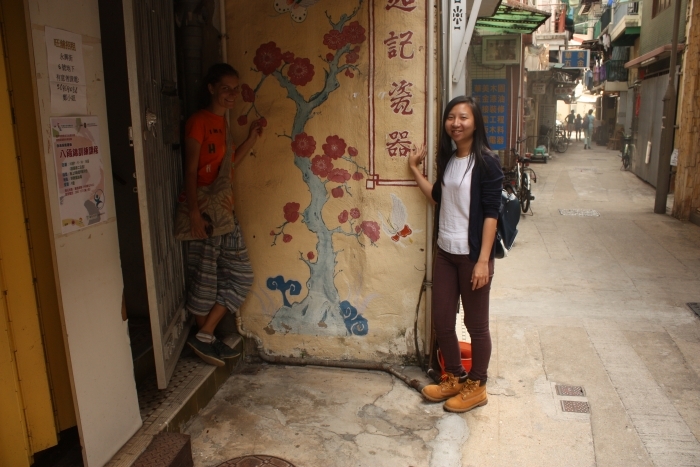 We got recommendation for the organization from our friend Irene who lives in Hong Kong. 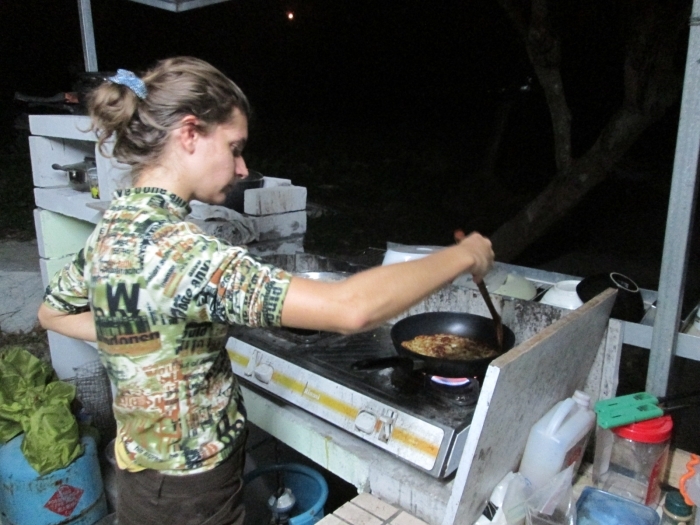 She was a long-term guest at hostel in Kuala Lumpur where we worked during summer months. She had an internship in Malaysia at that time and we hung out often during that time. Thanks for the great contact! We worked 6 hours a day, 4-times a week. Sleeping was provided in a tent directly at the farm, our shower consisted of bucket style with cold water and when it was too cold, we simply heated the water. Wifi was there, so we stayed connected from the outside desk in the middle of the greenery 🙂 Only vegetarian diet was allowed and we didn´t use any chemicals. I reminded me my one month-long volunteering in Solar Garden in Israel back in the summer of 2012 where we were not allowed to use any regular toiletries so I saved on shampoos and soaps. We only used biodegradable products which were purchased by the management. 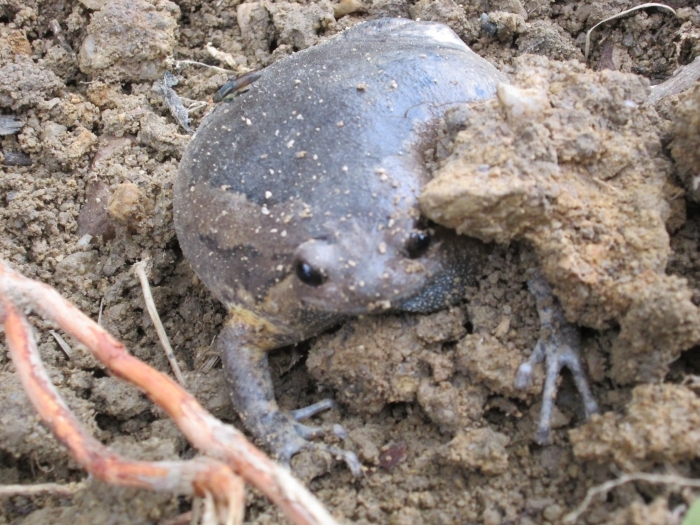 We found this underground frog when digging. It took us more than three full days to remove very strong roots from two middle-sized trees. When we made a jam, we didn´t use any conservants so we only mixed a very sour unidentified dark red fruit with sugar in a pot and cooked it to a full boil. It obviously didn´t have a long durability so we cooked a jam often 🙂 Lunch was made in a garden for all of us working that day and breakfasts and dinners were our own responsibility and we were the only two persons sleeping in a garden. Our co-workers went home after finishing their shifts as regular workers 🙂 It means we had a full outdoor kitchen for ourselves in the evening so we started being creative at some point. Several times we tried to make typical Slovak dishes like Cheese dumplings (Halušky) and Potatoe pancakes (Zemiakové placky), sometimes successfully, sometimes not 🙂 Interesting moment was when our co-worker King ate our traditional dish (Cheese dumplings already mentioned) with chopsticks :-). Check the photo album, the link is below article. In general, our co-workers and common citizens were rather quiet and considerate, not invasive and this was a huge cultural shock after very friendly, noisy and outgoing Filipinos. 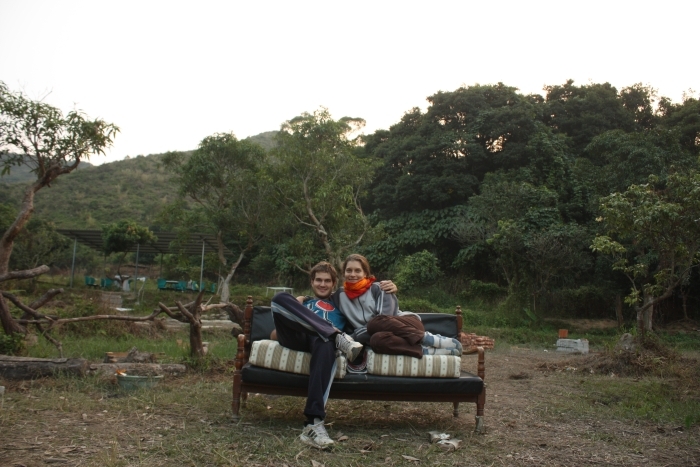 No one there in Hong Kong has a need for constant talk and we could finally recharge our exhausted inner batteries 🙂 Later on, we discovered that regular Hongkongers don´t consider working on a farm as a perfect career and rather keep following ordinary corporate path. Activities made by our 10-year old hosting organization were primarily dedicated to students of all types of schools and also to a general public. 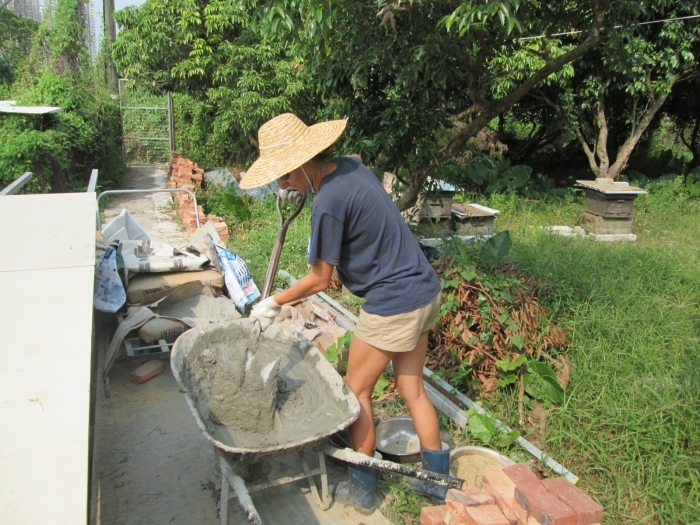 Garden programmes, outdoor education and workshops wanted to show to HK city dwellers the other greener part of their city-state and promote different eco-friendly way of life. I really appreciated the idea and they have my full support! Most fruits and vegetables found in Hong Kong came from mainland China and was of poor quality. Hong Kong is very dependent on agricultural products and simply imports lots of things even though its land are may be used for agriculture. (There was a small eco-garden installed right in the middle of protest area with explanation boards about Hong Kong food dependency on China and the call for action). We only realized the taste of most fruit and vegetables from the market was not really defined or simply it was definitely not that tasty as in the previous countries. Nothing compared to juicy mangoes from Nepal or very sweet Filipino bananas. There was mint plant, unspecific dark-red flower fruit which was extremely sour and some sweet potatoes in the farm. Except for that we bought everything. We try to see and enjoy as much as possible during our days-off. Few times we went cycling around the area, it means, we went to the Chinese border and saw the high rises of Schenzen city. 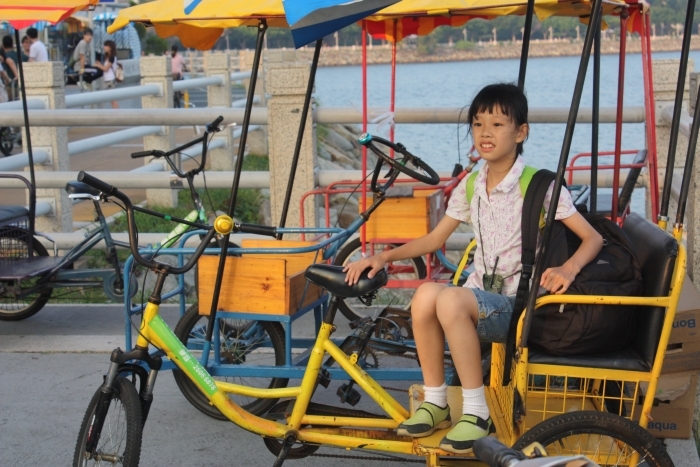 Other time, we cycled to the sea side to Tai Po. Hong Kong has an extensive and very well, maintained cycling paths, with an exception for downtown area, and we had impression that everyone posses a bicycle. Collapsible bikes with small wheels were very spread as they are easy to carry and travel by subway. If you want to take metro with a regular size bicycle, you have to remove the front wheel which is not very practical for daily commuting. Bicycling to the Chinese border during our day-off . The skyline belongs to the Shenzen city which was actually closer from our farm than Hong Kong skyscrapers. We visited about five museums and all of them were simply amazing! It reminded me of great museums in the United States I had the chance to visit during my work and travel summers (in New York City, Los Angeles or Philadelphia). 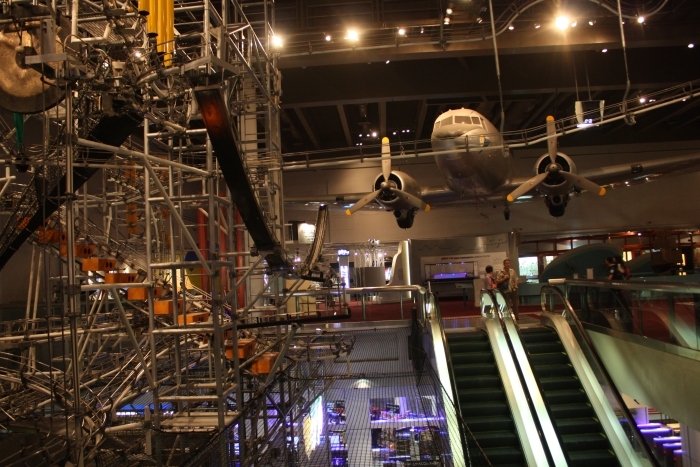 In Hong Kong, we entered Museum of art, science, space and history. There is free entry on Wednesday, so just try it when you are there! 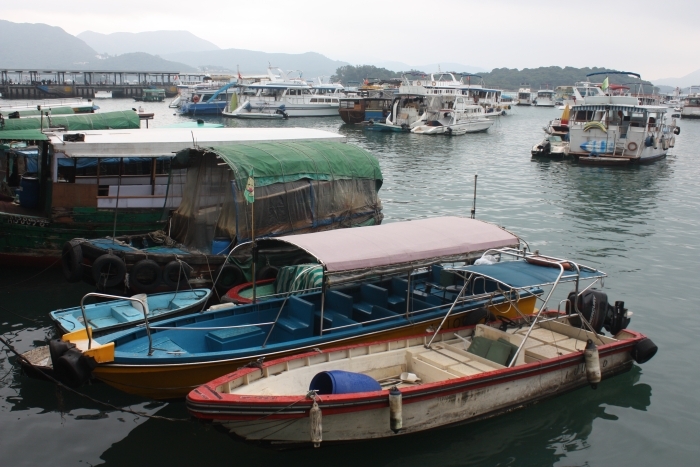 As I already mentioned, Hong Kong consists of 200 islands and many are easily reachable by ferry. Islands keep their quiet, villageous fishing atmosphere, no stress or white collar businessmen. The ferry fare is cheaper during weekdays and secluded beaches and its calm atmosphere is definitely worth visiting. In real hustle and bustle downtown, you can take historical double decker tram (in Hong Kong Island) and also ferry ride on old-fashioned Star Ferry from Kowloon to Central is unbelievable experience. Both above mentioned attractions cost less than 30 euro cents. 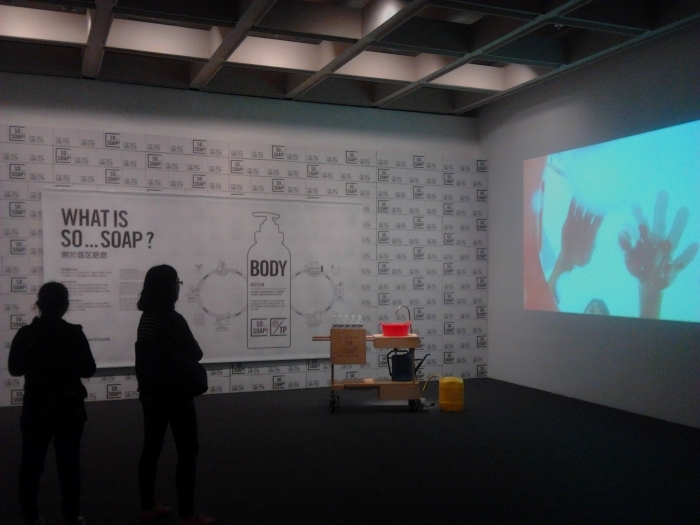 Museum of Modern Art in Hong Kong. Modern and beautiful. Wednesdays are free. Sitting Buddha and three friends! 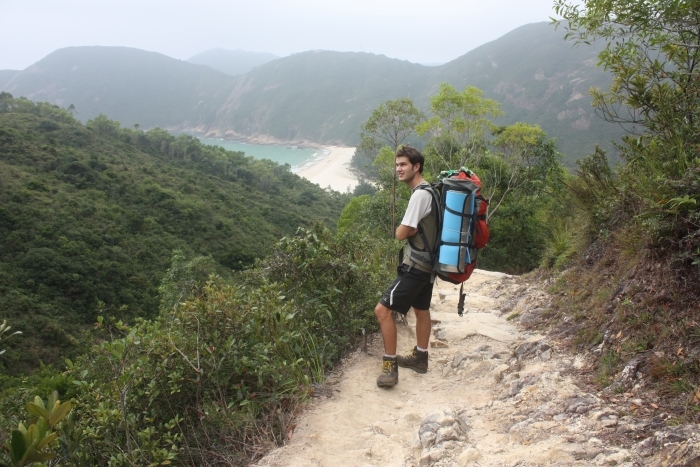 You can also do a good trekking in Hong Kong. There is 100-km long MacLehose Trail, stretching from the East to the West through the New Territories. It´s named after longest serving British governor in Hong Kong. We did first two sections of this trail in late November last year. The landscape was very diverse and epic. First day, we walked along the big reservoir. We camped in a lagoon and second day was about hill crossing and all those magnificent islands all around. We unintentionally chose weekend for the hike and the path was super crowded all the time with local and international trekkers. 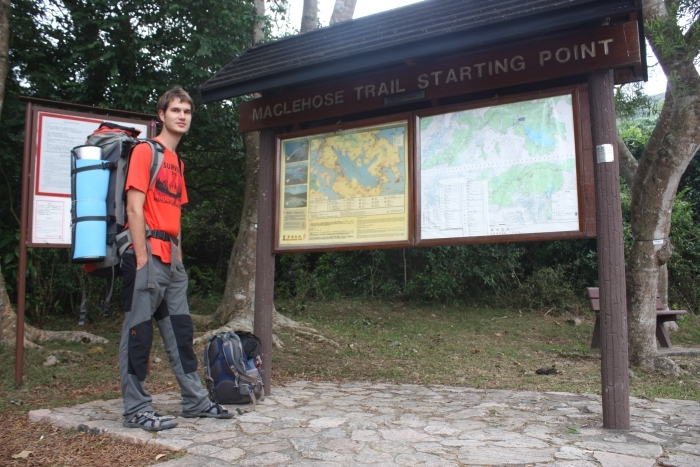 Trekking the first two stages of MacLehose Trail in the east part of Hong Kong. Two times, we tried and swam in quite cold South China Sea. We were surprised why it´s so cold. Hong Kong lies at 23 equator north so it´s shouldn´t be that cold, no? Locals didn´t swim much, only very sporty seniors and crazy foreigners (not only us!). Beaches were super crowded during sunny days as actually almost every part of this city-state. Hong Kong area is 1000km2 and population is 7 millions which means, it´s seriously very congested! 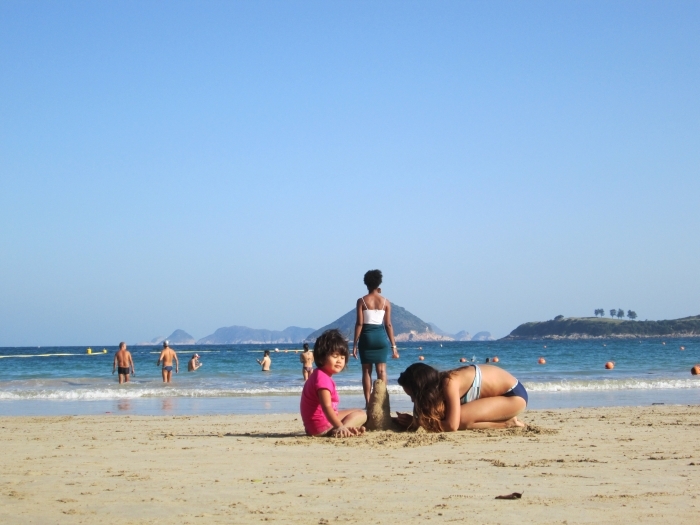 Beach time at Clear Water Bay in east part of Hong Kong at the end of November. 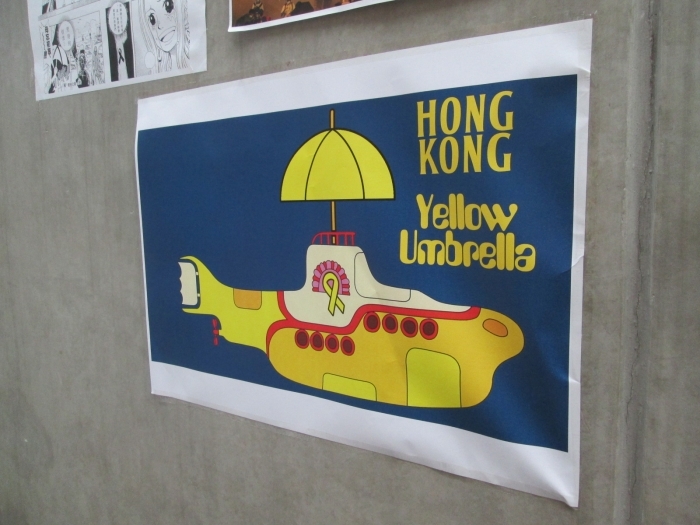 Hong Kong students protests or rather Umbrella revolution or Occupy Central. Discontent with central government of China and its attempt to interfere into internal affairs more than necessary and mostly the fact that China wants to do pre-screening of candidates for upcoming chief executive election in 2017 which supposed to be first (in)dependent elections since the British has left the country, led to a civil disobedience at the end of September last year. More than two months of protests happening on four different places in Hong Kong downtown greatly inspired fellows in Taiwan and Macao and of course angered Chinese central government. In late November, protesters were forced to leave the Mongkok area in Kowlon, which became again accessible for public vehicles. Protesters removed their tents but stayed present in the area and turned into shoppers and practicing windows-shopping in nearby stores in a huge numbers. After camping on the streets, big „shopping protest fever“ started. Police later arrested many genuine and many artificial shoppers and it was a big mess. I still like the idea of „mass protest shopping“! Protests in Admiralty in Hong Kong Island. 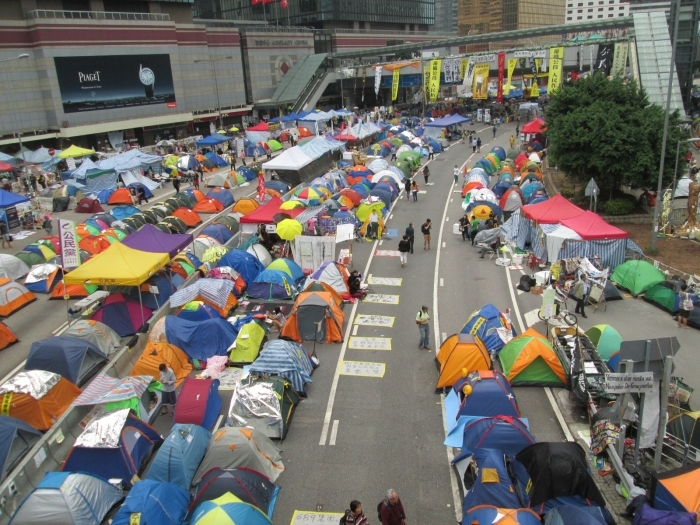 Protests in Hong Kong/ Umbrella Revolution or Occupy Central. 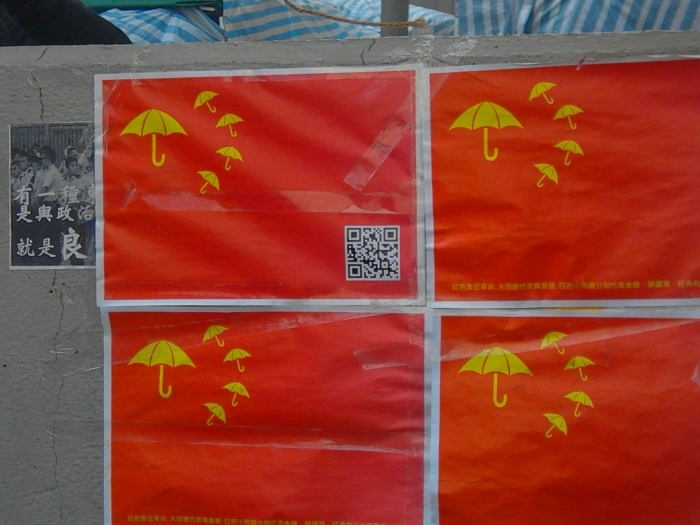 Symbols of protests were yellow umbrella and yellow ribbon. 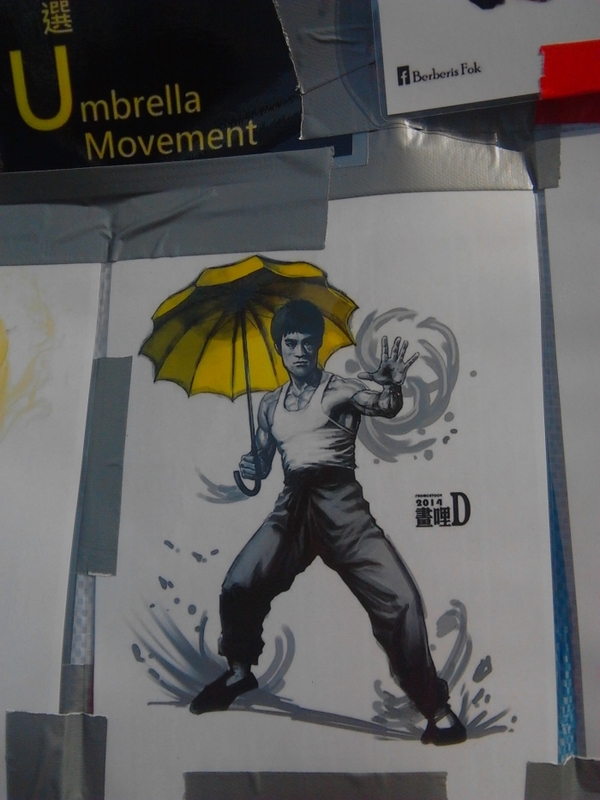 Also Bruce Lee, the famous Hong Kong kung-fu actor is supporting protests! In mid-December, protesters from Hong Kong Island (Admiralty and Central area) were forced to leave and as we are in India now and I have very limited internet connection, I cannot provide further details. I only wanted to mention that we visited all protest places several times during our stay in KH and I really liked the calm and determined atmosphere over there. We saw encouraging words written in many languages everywhere. Yellow umbrellas and yellow ribbons as a symbols of protests were present too. Actually still nowadays many of my Hong Kong friends have yellow ribbon as their profile picture on their facebook profile. 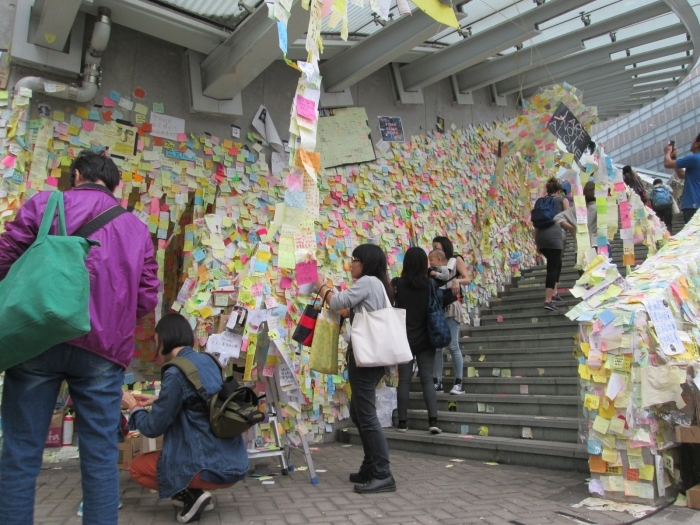 Walls full of notes containing supporting words from people all over the world. 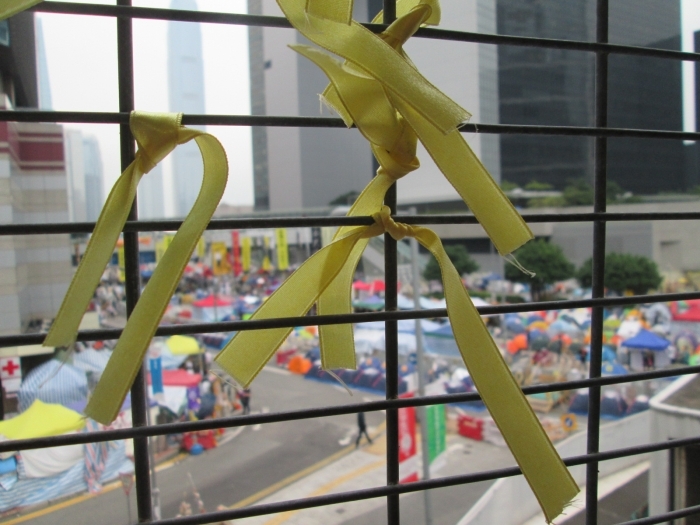 Yellow ribbon – symbol of Hong Kong protests is a common facebook profile picture of my HK friends. Remake of Chinese flag with protests symbols. This was the brief description of our seven weeks in the most congested destination in Asia. and many thanks for the readers as well!